While we’re speculating, I would love to see a solid family coaster with a low height requirement come to the park, when the time for a new coaster arises. 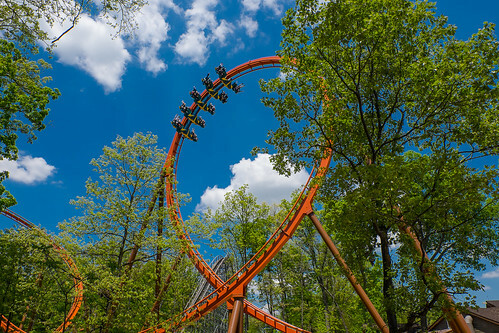 I think something along the lines of FireChaser Express or Manta at SWSD would be perfect, since that is their core demographic, and unless you count Raven or Legend as family coasters, it would really fill a gap. Throw me in the group of Giraffica haters. It looked like the coolest flume ever...and then you hit the water at the bottom and then that abrupt stop. I bit the inside of my cheek hard enough to draw blood. Ow. Glad to hear about the shows though...this park needs something like that. ^ I never rode Giraffica/Pilgrim's Plunge (why the name change by the way). I've never even been to HW. But I've been on other chute-the-chutes, and I've honestly never been all that impressed with them. To me they've always just seemed like a gimmick. I know I'm probably in the minority, but they are just big boat slides. I've done Perilous Plunge and Tidal Wave and I don't get the draw. At least Jurassic Park and Pirates of the Caribbean have substance to them. But most are just up and around a curve and down a drop. I can get better drops on a roller coaster. There are even very few log rides that I can stand, such as Timber Mountain and Splash Mountain, because honestly most have nothing to them. You float down a trough of water and then go hurtling down a drop into a pool of water. Whoopie. So I'm not surprised that Pilgrims Plunge and Perilous Plunge are gone already. They've run their course and novelty wears off. What I am surprised at is that Tidal Wave is still around. I guess my point is that space would be much better served for a future coaster or two. I still think they're going to re-use most of what used to be Pilgrims Plunge for a similar attraction. I see where your coming from, but I don't think it was any more of a gimmick than your standard splash boat ride. I just don't believe the ride turned out the way it was supposed to and to add to that it had a lot of complications. I believe they were trying to incorporate it into Splashin' Safari after the new slide complex was constructed east of Voyage, which is now awkwardly out of place. I see what they were trying to do. The splash boat ride part is the gimmick to me. I mean if it could somehow be incorporated into the theme of something bigger, like a whitewater rafting ride that make sense. Like you were going over a waterfall in the Seirras or something. But just going up and around and splashing down and maybe getting a little wet? Meh. To each their own I guess. I'll never tell anyone they are wrong or dumb to like something. That would be wrong of me. Just saying it's not my cup of tea and I don't get it. So I don't miss them. Give me a good coaster any day. Heck, give me a bad coaster over a chute-the-chutes. Chute, I'll ride Pony Express again before PP, if it was still around. WestCoasterKing wrote: Chute, I'll ride Pony Express again before PP, if it was still around. I see what you did there. I don't really care for Chute the Chutes either, except for not waiting in line and standing on the bridges if you want to get soaked (though not possible at Holiday World because the splash was nothing as advertised --- I did like that you could ride from the dry or wet side though so you didn't have to worry about squeaky shoes). Though I think I'd take a one hill boat ride over Pony Express. 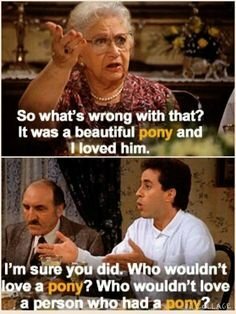 Sorry, pony. WestCoasterKing wrote: The splash boat ride part is the gimmick to me. I mean if it could somehow be incorporated into the theme of something bigger, like a whitewater rafting ride that make sense. Like you were going over a waterfall in the Seirras or something. But just going up and around and splashing down and maybe getting a little wet? Meh. Yeah, good point. Basic bish splash boats were kind of a 90's cheap thrill. I remember as a kid how everyone raved about Tidal Wave at SFSTL and standing in a 45 minute queue to ride it. Have you ever been on the splash boat rides at Sea World or BGW? The names escape me, but they were pretty entertaining and heavily themed. I didn't ride the one at Sea World, but we braved the one at BGW. They had a cool indoor section with a massive fireball. Festhaus contributed to our decision to ride... Luckily, we didn't get soaked. Was it Sea World SD? I never knew they one. And I've never got to Busch Gardens, but I've seen videos. That's the kind I think I could enjoy because there's more to it than just up and around. I appreciate good theming, sometimes even over a ride itself. Great theming can push a mediocre ride over into enjoyable. I know this isn't the Knott's thread, but I'm going to make an example of Pony Express to make my point. Had they built some rock work and made it seem like you were galloping through some canyons it would push that ride over into awesome, even with it being so short. That's what I'm saying about chute-the-chutes. To me they are the type of attraction that can't stand on their own. But as an element of something larger like Jurrasic Park, they can be great. I think HW missed the boat, so to speak, in doing something more with Pilgrims Plunge. With the elevator lift they could have made it like you be were in a mill of some kind or done something with the slow winding approach to the lift, like an enclosed dark ride. A ride like Perilous Plunge could have been built into a faux volcano on a tropical island. And you're on a boat and have to escape the island or something. I guess my point is theming goes a long way to making a great experience. There's more to a ride than just the ride. Sure, they could have themed Pilgrims Plunge like it was at Disneysea. And it would have been the most expensive lipstick on a pig imaginable. The ride was balls.